This easy cucumber salad recipe makes a nice accompaniment to any meal. Slice the cucumber in fancy ribbons or cut into chunks or sticks. The recipe calls for dried herbs, but fresh herbs are excellent if you have them. See the reader comments and tips and variations for some substitution and other ingredient ideas. This cucumber salad goes well with pork or ham, and it makes an easy side dish for a cookout or barbecue. Slice the cucumbers thinly or cut the cucumber into half-inch dice or sticks. Alternatively, cut the cucumbers in half, core them with an apple corer, and use a y-peeler to make "ribbons." 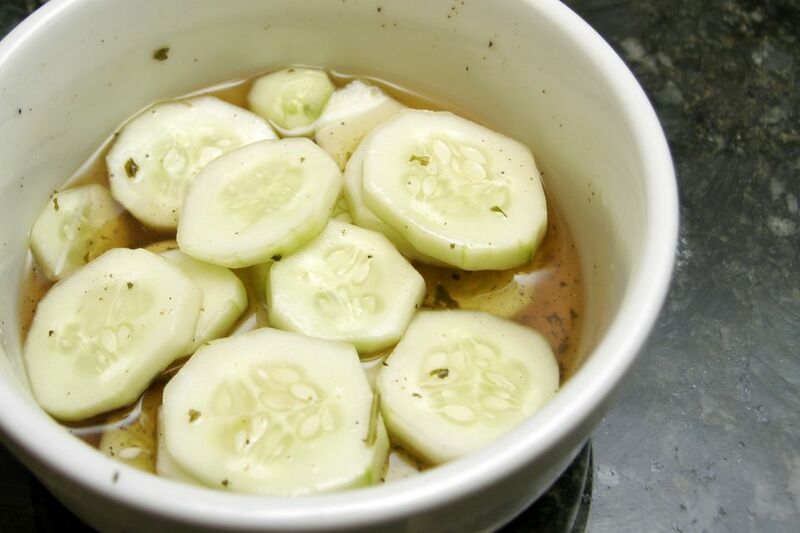 Put the prepared cucumbers in a serving bowl and set aside. In a saucepan, combine the vinegar, water, sugar, salt, cayenne pepper, parsley, ground black pepper, and basil. Place the saucepan over low heat and cook, stirring occasionally, until the sugar has dissolved. Pour warm mixture over cucumbers. Cover the dish and chill thoroughly. Store the salad covered in the refrigerator. For a fresher salad, use fresh herbs. Replace the parsley flakes with about 1 teaspoon of fresh parsley and replace the dried leaf basil with 1 teaspoon of chopped fresh basil. Replace the basil with dill or oregano (1/4 teaspoon dried or 1 teaspoon fresh). Cucumber Tomato Salad: Dice 1 or 2 medium tomatoes and toss with the cucumbers. If desired, top with 1/4 to 1/2 cup of crumbled feta cheese. Add thinly sliced purple onion to the salad. After draining the salad, stir in 1/2 to 1 cup of sour cream or Greek yogurt.